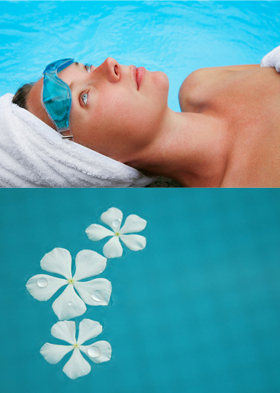 Hydrotherm Massage is a completely different kind of massage. You lie back on a sea of warmth and relaxation supported by two heated water cushions. Throughout the treatment you will lie face upwards without the need to turn at any point. The spine will be in perfect alignment making this position very comfortable and beneficial for many conditions. The whole of the back is in contact with the heated water cushions at all time making this an ideal treatment for those who find lying face down uncomfortable. The therapist with the use of oil, slides their hands under, over and around the client’s body in an uninterrupted motion using the client’s own bodyweight as a source of pressure. This facilitates an extra deep massage technique with the gentle heat of the water increasing the circulation, removal of toxins and relaxing tight tense muscles. Hydrotherm Massage induces a deep state of relaxation and can be particularly beneficial to clients unable to lie face down or turn over easily, pregnant women, the elderly, claustrophobic or asthmatic clients. It can also help where postural correction is needed, MS, ME, arthritis, muscle strains, fibromyalgia, stress and anxiety.